Ms. Clinton wants “equitable” growth meaning huge new public spending on such things as infrastructure, free public college tuition universal pre-K education as well as increasing the minimum wage to $15 per hour nationally and mandating paid family leave. More public spending and new mandates will provide only minimal economic growth. Mr. Trump wants to restrict the labor force with immigration controls and raise the price of imports with new tariffs. He would also cut tax rates across the board (good idea) but in such a way that would increase the national debt by $10 trillion over the next ten years (very bad idea). 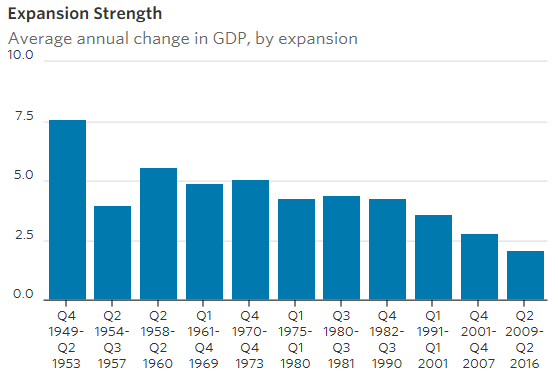 The U.S. is in its weakest recovery since post WWII. The average growth rate of 2.2% for 2012 – 2015 has now stalled in the past year to just barely 1%. Consumer spending has been increasing steadily and rose 4.2% in the second quarter of 2016. In other words, consumer demand is at a high level. 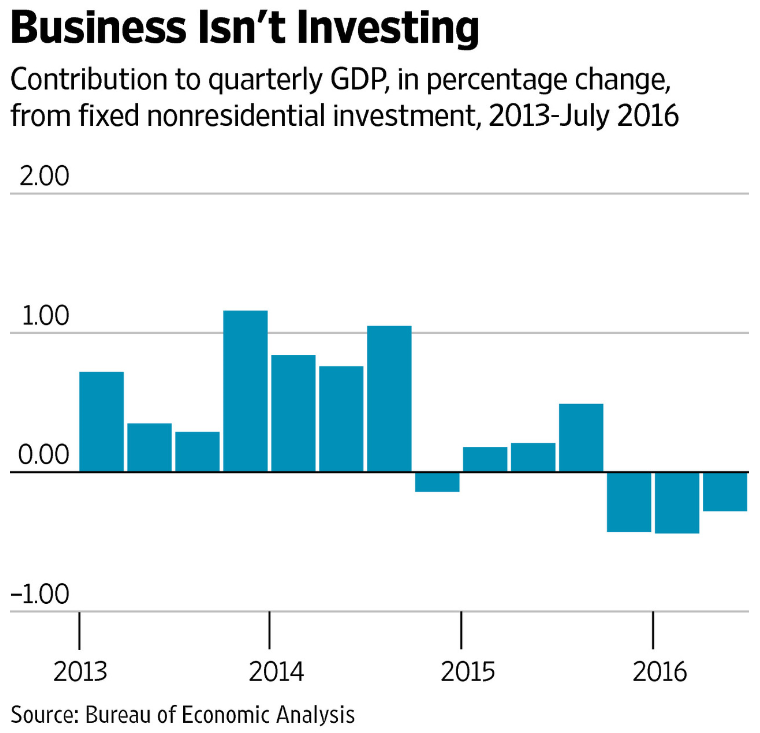 The problem is that business investment, i.e. supply, has decreased. Lower the top corporate tax rate from 35% to 20% and establish a territorial system, to encourage multinational corporations to produce in the U.S. as well as bringing their foreign earnings back home for reinvestment. Provide a tax-free return on new investment by allowing, for the first time ever, for full and immediate write-offs. Conclusion. The House Republicans have a sensible plan for getting our country back on a much faster economic growth track. Regardless of who is elected president, the House is likely to stay under Republican control. I am waiting to see if either of the presidential candidates will figure this out and adjust their campaign messages accordingly. This entry was posted in A Better Way, Better Way, Donald Trump, economic growth, economic momentum, Hillary Clinton, Jack Heidel, Wall Street Journal and tagged debt, Donald Trump, economic growth, Hillary Clinton, jack heidel, Wall Street Journal by jackheidel. Bookmark the permalink. I am aware that the funding of residency training for specialists is largely funded directly by Medicare, something around $18 Billion a year. I am also aware that the state by state funding is largely allocated by the size of the healthcare research industry in each state. And, there is no fine print about its allocation to Primary Physician specialties. REALLY ! Finally, the size of this funding has not changed for several years, even though the medical schools have increased their graduation rates by more than 10%. OK OK, again, it doesn’t add up. I’m in total agreement with you on the basic problem that health care costs are growing too fast and are a main contributor to overall slow economic growth. How we get health care costs under much better control is a very difficult problem. Trump, in his typical disorganized fashion, is not dealing with the issue at all except to say that he won’t touch entitlements. This is a non-answer. Clinton is mostly ignoring the issue except for proposing to at least partially expanding the Medicare model. But it is Medicare which is the problem to begin with! We have basically two choices as I see it. Either we go to a single payer system like much of the rest of the world, and understand that it will lead to severe government controlled rationing, or we try to move the whole healthcare system from a defined benefit model to a defined contribution model, which places far more responsibility on the individual to keep track of his/her own costs. Interestingly, the current movement towards higher deductible insurance, along with health savings accounts perhaps included, amounts to a step in the direction of the second option. Paying for specialty training with very, very tight Medicare funds does not seem to me to be a viable model! Do you have a better suggestion? One thing I’ve picked up since our last meeting is that the ACA has a several billion dollar budget line for the Community Health Cooperatives (?) which you are interested in. Let me know when you’d like to go to lunch again. I greatly enjoy our discussions!